A few weeks ago I spent the day at my friend Genevieve Jorn's home. 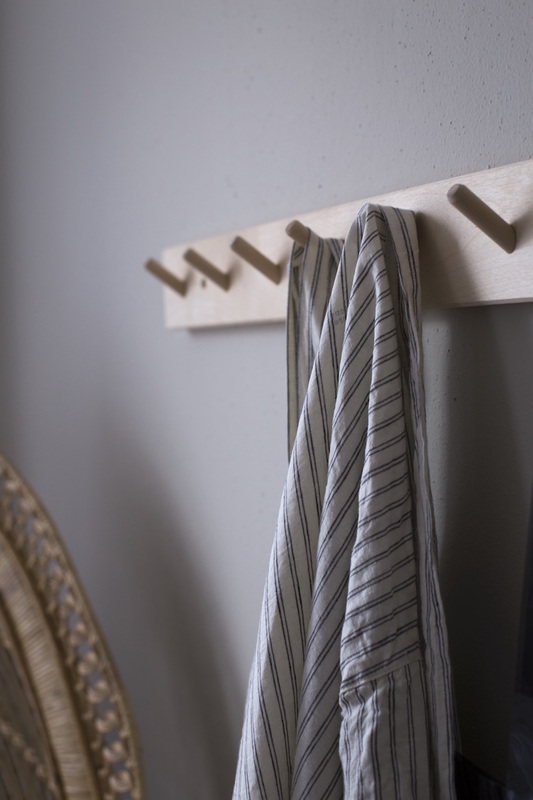 The French Canadian interior designer is a regular contributor here at MSH (I'm soooo lucky!) and lives in the most incredible early 20th century apartment in the centre of Malmö. You might recognise her home from this and this post. Then again you might not. You see, Gen has the propensity to update her apartment even more than I do (and that's really saying something as you know!). 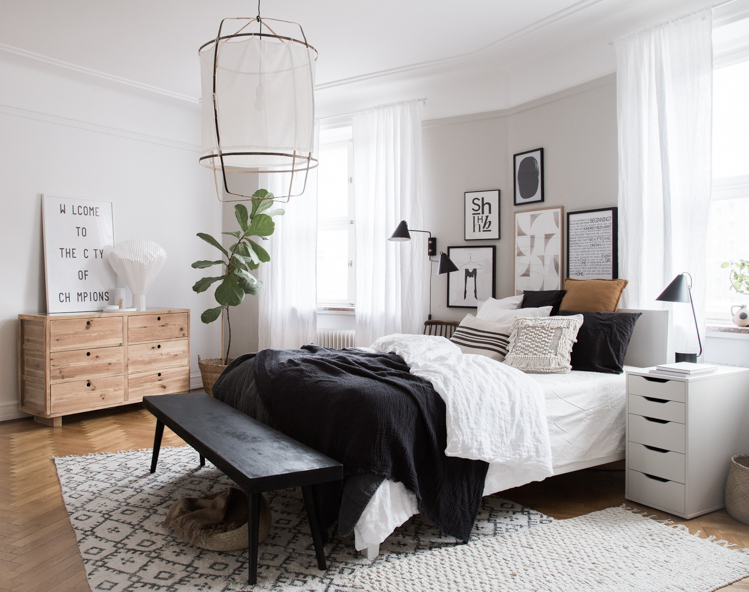 The latest room to be given a facelift is her bedroom. With spring just around the corner (yippee! 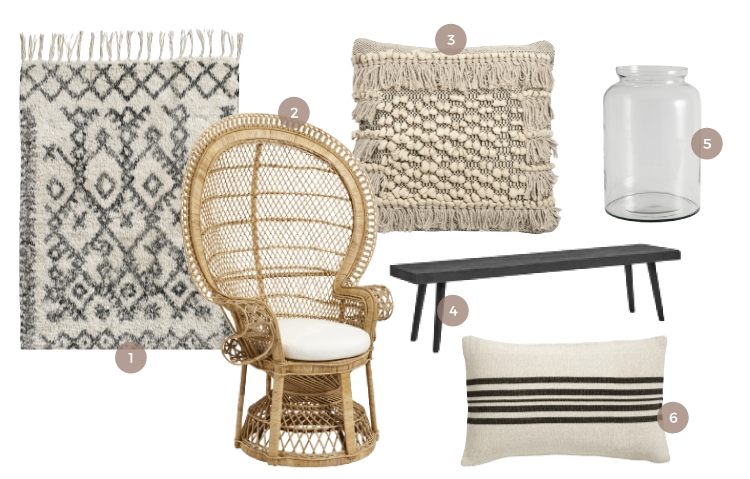 ), Gen moved away from slightly darker, moodier notes to a fresh look and feel while keeping the look warm and inviting with a touch of rattan and layers of textiles (love the Nordal cushions and rugs). Enjoy the tour! 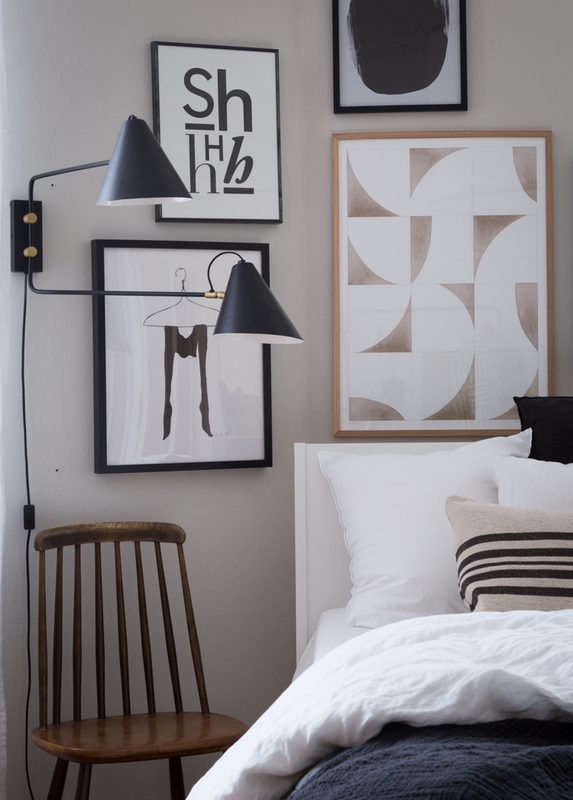 Gen's three metre high ceilings and large bedroom is the stuff of dreams. I mean, could you imagine?! Even so, it can be tricky to create a cosy vibe. To compensate, Gen used a mound of soft cushions, throws and rugs (see below for details). The walls have been painted in SPACE by Jotun Lady Pure Colour up to the border which also helps to create a more intimate feel. 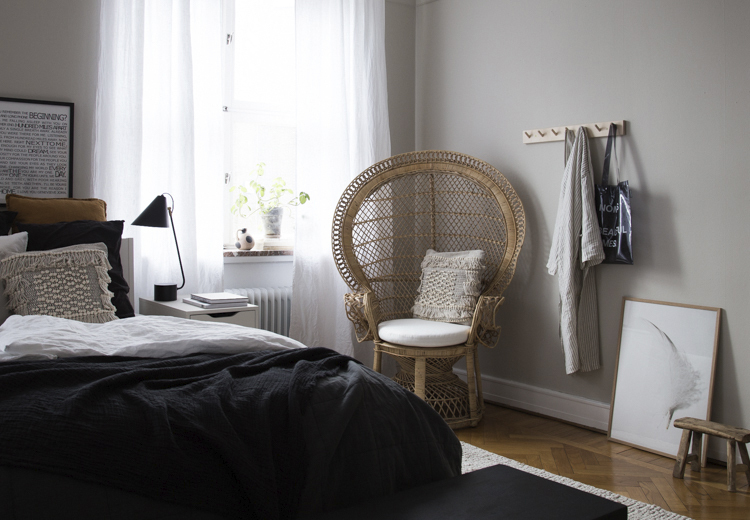 A simple wooden chair works perfectly as a bedside table! Admittedly, mine would have a mountain of stuff on it ("Chairdrobe: Piling clothes on a chair in place of a closet or a dresser") but Gen's one organised lady! Check out this post for more details on the fabulous prints! 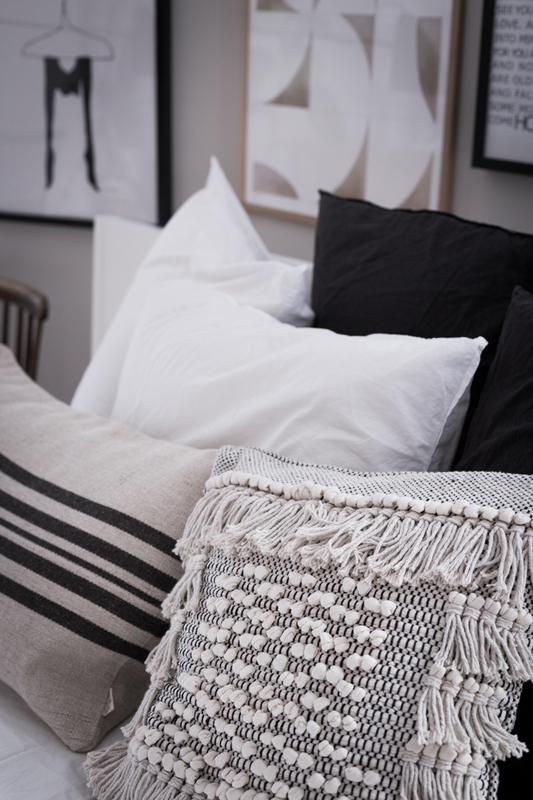 Mixing and matching patterns and textures is the way to go for a warm and inviting look - I love how some of the cushions like this one have a bit of of a boho vibe going on too! I'm such a big fan of Peacock chairs, there's something decadent yet understated about them - could you imagine having one in your home? Or perhaps you already do (I've got one in my bedroom)! "I love how the light shines through the chair and casts shadows on the wall." Genevieve Jorn. Oj oj oj (as they say in Sweden!) what a lovely bedroom! Could you imagine sleeping here? If it were my bedroom I'm not sure if I'd ever leave! Once again, you can find out more info on the prints and a few other details here - and just give me a shout in the comment section below if you're wondering about anything else! Hello!, So happy to discover her work! So many ideas and inspirational pieces)) Thanks for sharing. Have a beautiful week! Gen's soooo talented. Everything she does turns to gold! It really is so cute. I'd love a bedroom like this! What I like about this room, is how she made up for its irregular shape with all the awkward edges. Nicely done with an interesting art gallery wall that gives such a personal vibe. Totally! I bet the angles weren't easy but Gen's worked so well with them! 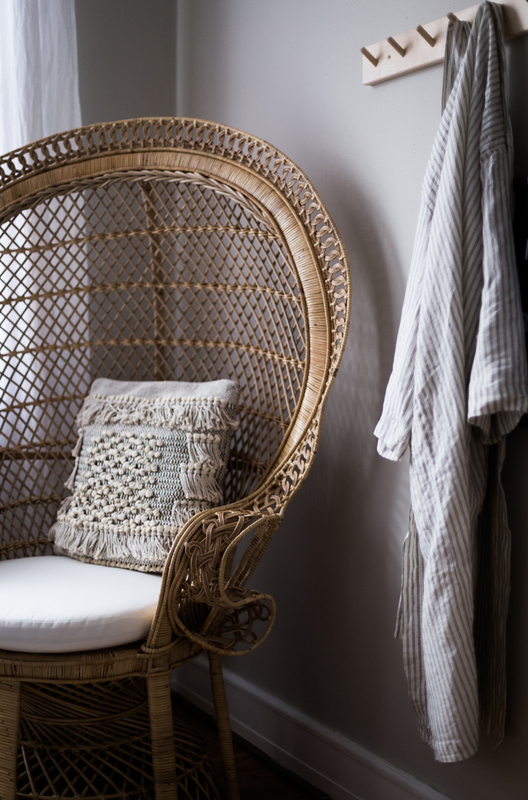 I love the rattan chair too, it's beautiful! Love this style, so inspiring, and cant believe she lives in the same city as I do. Unglaublich gemütlich eingerichtet und eine tolle Kombination der Wohnaccessoires! wait how are we not talking about the LIGHT FIXTURE! I need this. =) Any details? Love it! The light fixture is A-MA-ZING, it's the Z1 pendant by Ay Illuminate (I've got the same in my sitting room and it looks beven more beautiful in the evening with a dimmed light! ).